Well known in American comics fandom since the 1960’s for his vast comic book collection and comics fanzine activities, Rosa became internationally famous starting in 1987 when he began writing and drawing Uncle $crooge and Donald Duck comics for various licensed publishers in Europe. Just as they once were in America, Donald Duck comics (based on Carl Barks’ work) continue to be the best selling comics in Europe and South America where the weekly (!) Donald Duck comics have been read by hundreds of millions of fans for over 60 years. This makes Rosa one of the world’s best known cartoonists, but still very easy to visit with at American shows where he can relax in “relative obscurity”. American comics fans are mostly familiar with his most famous work, the Eisner Award winning Life and Times of $crooge McDuck series. 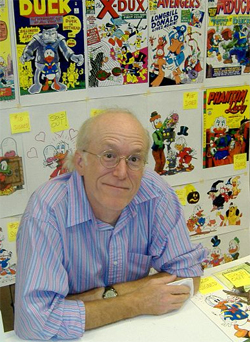 But American fans can also now see his entire Duck comics career reprinted chronologically in the new Don Rosa Library from Fantagraphics. Rosa has quit producing new Duck comics due to several reasons, but he stays very busy with signing tours to Europe, visits to American comic cons, and his many hobbies including growing exotic chile peppers, of which he is even now probably giving away bags in the convention hall.